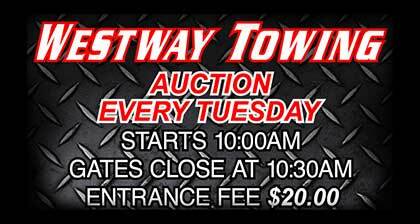 Live auction every Tuesday, starts at 10:00 AM. Gates Close At 10:30 AM. Entrance Fee is $20. 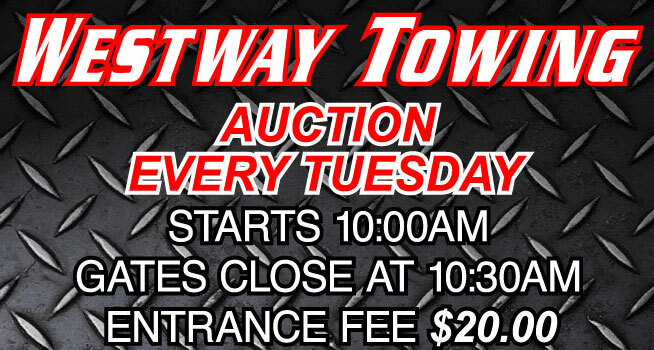 We auction cars, motorcycles, boats, motorhomes, trucks, and trailers as well as other types of motorized transport. Vehicles are sold “as is” to the highest bidder for impound charges owed. Our storage facilities are a combined 9 acres with 5 locations. Our facilities are fully insured and manned 24 Hours, 7 days a week and strategically located in Broward and Palm Beach Counties. Westway Towing, Inc. is uniquely qualified to effectively accommodate the needs of the public. We distinguish ourselves by recognizing the importance of courtesy and customer satisfaction. This is reflected in our Mission Statement and the special features our company.